What is a kosher movie? As a youngster, I often found it hard to see how older people can be in love in the conventional romantic sense. After all, physically they were often overweight, had sagging skin, and possessed grey or no hair, hardly the attributes I would consider beautiful. But when I myself got older and also began to manifest those same characteristics, I realized that seniors could be deeply in love, and physical attributes were not important. Love transcends the physical in happily married couples. In time, I understood the wisdom of King Solomon in Proverbs who, in praising the woman of the house, reminds us that “outward grace is deceitful and beauty is vain,” and that the basis of enduring love is a shared life vision based upon a common spiritual destiny, not the smoothness of one’s skin or the size of a waistline. Spouses married for many years view love in ways that are impossible for newlyweds to understand. The ebbs and flows of life, the sharing of joys and sadness, bring loving couples closer together. Each represents a safe harbor to the other, a place of refuge from a world that is shutting down around them, when mortality is not an abstract concept, but an ever-approaching reality. This deep connection only develops over time, and does not come about instantaneously. Another message of On Golden Pond relates to Norman’s relationship with this daughter Chelsea, from whom he has been estranged for many years. Chelsea calls Norman by his first name, which underlines the emotional distance between them. She returns to the summer cottage to celebrate her father’s 80th birthday, but she still carries baggage with her. She remembers all the times her father was absorbed in his own pursuits, and not present for her emotionally. Her mother finally rebukes her: “Don’t you think that everyone looks back on their childhood with a certain amount of bitterness and regret about something. You’re a big girl now. Aren’t you tired of it all? It doesn’t have to ruin your life.” This is a valuable life lesson: get rid of old, unpleasant memory tapes; look with fresh, unbiased eyes at your old relationships and begin anew. Chelsea eventually does this and, after many years, calls her father “Dad,” not by his first name, suggesting that she is now prepared for a new relationship with her father. In Jewish law, a child is forbidden to call a parent by his first name. This implicitly instructs the child to be constantly aware of a parent as someone who is a source of authority, guidance, and love, not just another buddy. 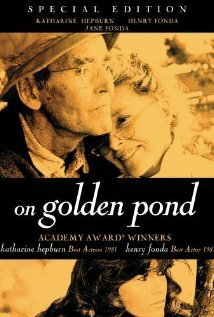 On Golden Pond reminds us to revisit our parental relationships, repair them if needed, and create new memories that will bind together generations in the future. Purchase this movie from Amazon.com. Posted in Drama, Family friendly, Movie review, Romance. Bookmark the permalink. Very lovely to read your thoughts about this movie and how it relates to our Jewish beliefs.